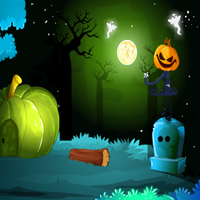 Find Spooky Treasure Pumpkin House is another point & click escape game developed by MirchiGames. In this game, our witch - well known from the previous games - now requests you to find her envelope. Use your wits by solving some interesting puzzles with the help of hidden clues. Click on the objects to interact with and solve all puzzles to finally get the envelope for the witch from the pumkin house. Good luck and have fun!